This story originally aired on World Vision Report in November 2008. 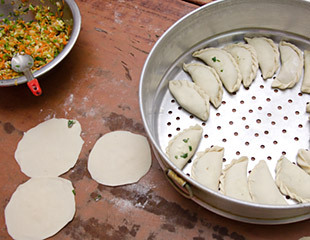 DHARAMSALA, INDIA — Tibetans love their momos — small steamed dumplings (similar to Chinese potstickers or Japanese gyoza). They’re particularly popular in Dharamsala, India, where many Tibetans live in exile. In this “What’s Cooking” segment, we find that in exile, Tibetan cuisine can’t avoid mingling with the flavors of its host country or escape the influence of the many Western tourists who stream through the Himalayan town.